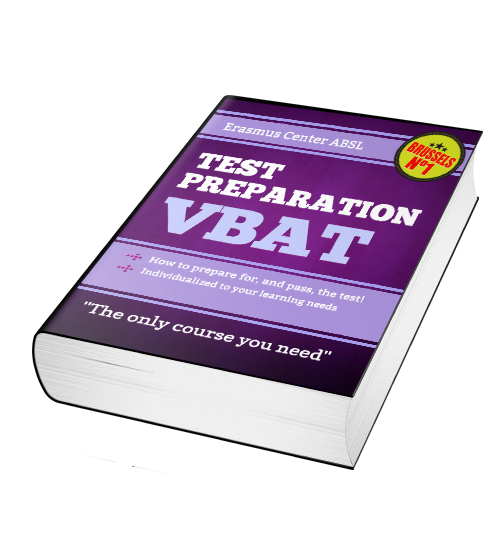 The VBAT is a comprehensive exam similar to a GMAT® or GRE® covering analytical and verbal sections that can be difficult for many students who have not prepared. The Erasmus Center teachers are familiar with the admission process and can guide you thru the tutoring needed for all three parts of the Vlerick Admissions. Our VBAT preparation is individualized to your learning needs and designed to get you the best score possible on the exam. After a fully simulated VABAT diagnostic exam , we will develop a tutoring plan specific to your diagnostic results and then present the options for paid tutoring to you. Erasmus Center also offers regular FREE Seminars on exam preparation topics and admissions processes. The Erasmus Center offers you a free diagnostic test so we can best understand your level of understanding and develop a personalized plan for your tutoring. This is a fully simulated test under real exam conditions. Tests are given weekly – contact us and schedule your test today. Why a live tutor better than an online prep course? You’ll get personal feedback. Because the test is about understanding the concepts and materials, talking to a live person will give you the advantage you need to master the test. You’ll get professional training. Simply knowing the test material is not enough – our expert advice is designed to help you take the VBAT test with confidence. Verlick and VBAT are terms used for the Verlick Business School which is not associated with Erasmus Center, ASBL. The Verlick Business School (Verlick) does not endorse Erasmus Center, ASBL publications, services or products.